This treatment is a combination of Hot stone with full body Thai oil massage together which provides a very healing and effective experience. The hot stones also expand blood vessels, which encourages blood flow throughout the body. The hot stones have a sedative effect that can relieve chronic pain, reduce stress and promote deep relaxation. Some people find the warmth of the hot stones to be comforting and deeply relaxing. 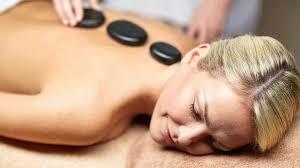 It's also suited for people who have muscle tension but prefer a lighter massage. The heat relaxes muscles, allowing the therapist to work the muscles using lighter pressure.